Home » Do You Know Shinola? Last December, my wife presented me with a Shinola watch for my birthday. I wasn’t that familiar with Shinola other than knowing the company was based in Detroit. I was initially drawn to the packaging of their product, which spoke of elegance and craftsmanship. The handmade wooden box was adorned with an engraved metal tag detailing the name of the watch builder and the series number of the product. A small container of leather balm was enclosed to assure the longevity of the hand-stitched watch band. 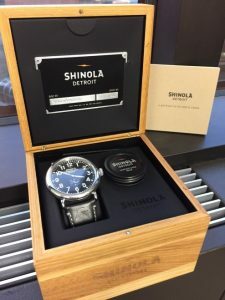 The product’s distinctive packaging was obviously designed to convey Shinola’s intended upscale brand. Unlike watches, financial services are not tangible goods, but each firm’s brand can be conveyed by how it packages and delivers its services. For Legacy Trust, our brand lies in the successful delivery of an exceptional client service experience. It starts with something as simple as assuring each incoming telephone call is answered by a human being, followed by frequent, proactive communications, and an unwavering principle of always serving the clients’ needs above all else. Each step of the Legacy Trust client experience is designed to leave the impression that they are the firm’s most important client, irrespective of size, and that our entire team is dedicated to serving their financial needs now – and into the future. Over the past year, I became more curious about Shinola and began surfing their website, reading articles about their origin and ultimately began following them on Twitter. The more I read, the more I was impressed with their focus on tradition. In 2012, Tom Kartsotis, an accomplished entrepreneur, made the decision to counter the mass-produced goods, primarily imported, by creating a hand-crafted, American-styled watch that would revive the American manufacturing legacy. Everything from the company’s distinguished name (formerly a maker of shoe polish) to the chosen manufacturing location in downtown Detroit bespoke tradition. Over thirteen years ago, the founders of Legacy Trust decided to counter the financial industry’s increased focus on product sales (mass-produced) primarily led by large companies headquartered outside of Grand Rapids (imports). The name Legacy was specifically chosen to honor the tradition of families handing down wealth and values. In addition, Legacy Trust’s competitive advantage was not only our Grand Rapids location, but our purposeful intent to honor the traditions of those former Grand Rapids banking giants who over time had developed stellar reputations for their integrity and zeal to deliver the best products and service to their customers. This special gift from my wife has now adorned my wrist for almost a year. It is a daily reminder that quality matters in whatever you do, whether you are building watches or partnering with families to build and preserve their legacies.